When I saw Andrew Masullo’s paintings at Mary Boone a few weeks back, they struck me then, as they did the first time I saw his work in person, at last year’s Whitney Biennial, as both smart and funny. They’re playful, making use of a kind of free and casual mastery of fundamental formal considerations— figure-ground relationships, illusion, the kinds of perceptual patterns described by gestalt principles. A multitude of small works comprises the show. Most clump together in asymmetrical groups on three of the large gallery’s walls; a handful of tiny works, the canvasses just a few inches in either direction, stretch in more orderly fashion across the fourth long wall. 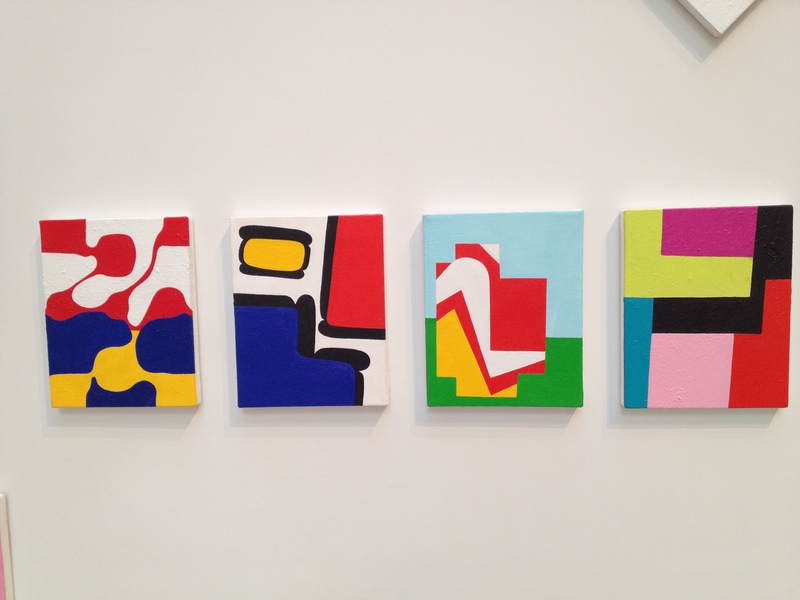 Though the vocabulary remains consistent— small size, bright colors, clearly defined shapes— each work seemingly deploys a unique strategy to surprise and entertain the eye. For example: in the left-most of the four works pictured above, amorphous shapes connected by thin tendrils dot the canvas. As the red forms at top give way to the yellow at bottom, the white background switches to blue. But this blue asserts itself, refusing to remain passive, negative space. When I look back at the top of the canvas, the white, which had seemed so recessive, now surges forward, my eyes having adjusted to see it differently. The short line where the red and the yellow meet is the only straight line in the painting, discounting those formed by the edge of the format. That line becomes the epicenter of incredible tension. The next work to the right seems an cropping-in of a Miro or a Mondrian, only rendered more cartoonish by the oddly pneumatic black lines that outline the primary shapes. In the third work, Masullo seems to feint toward a familiar scene: a strong horizon, green grass below, blue sky above. But he’s left out the trees, herds of cattle, or picnicking foursomes: breaking this putative horizon is an abstraction, a sort of fattish, irregular greek cross. This shape has, with the exception of one brief white arc, a largely rectilinear outline, running parallel to either the verticals or the horizontals of the canvas. Its interior divisions, however, are mostly off-kilter: diagonals that cut from side to side, an elbow-curve that loops downward. These lines create a sense of torque; the red rectangle at right restores balance. (I name it a rectangle, and we can’t, I think, help seeing the rectangle within it: of course, its actual shape is something more complex.) In the last work in the row, there are six different shapes, and each is a different color. At the outset, I called Masullo’s work “smart and funny.” The intelligence, I’ll trust, is self-evident. It’s the humor I’d like to discuss more. 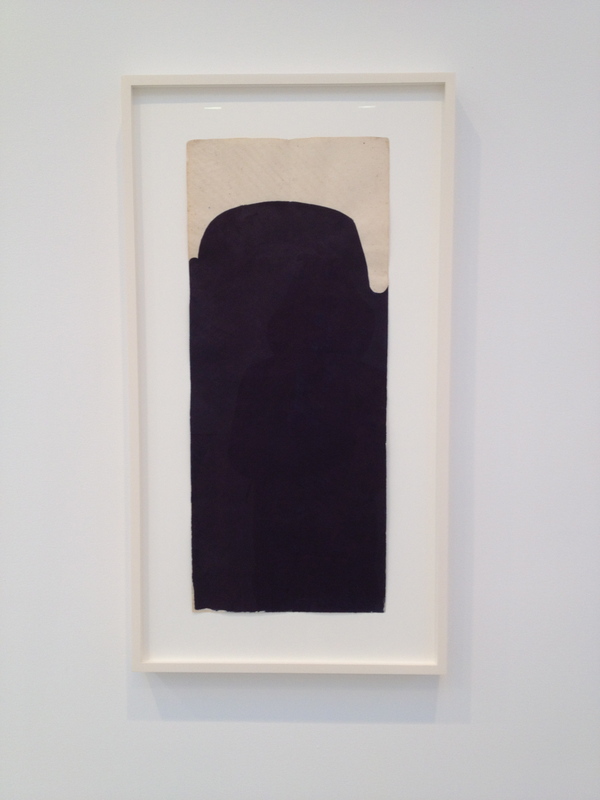 David Zwirner’s exhibition of Suzan Frecon’s works on paper overlapped the Masullo show. At first glance, the respective bodies of work share only basic characteristics, a penchant for idiosyncratic shapes, a commitment to abstraction and skill being chief among them. The tone of each seems markedly different: Frecon’s work is serious, not funny. Several bright yellows and some ultramarine patches stand out; otherwise, her palette tends toward rich, dark, often earthy tones. She uses a variety of exotic, highly specific papers. (Most are on “old Indian ledger paper,” sometimes “found,” often “agate-burnished.”) One drawing in the front room, painting plan drawing for a large painting, seems a key for the rest, establishing many of the possibilities of shape and composition explored by the other works in the show. Seriousness was my first impression, and largely it remains. But a few of those titles are a bit arch (so to speak), and the longer I look at the drawing at left– the way the black form pushes up at left where it meets the edge of the format and, at right, is pushed down by the neutrality of the page– I’m not sure it’s not humorous. In fact, I think it might be the visual equivalent of seeing a fork in the road and taking it. We have seen that the more society improves, the more plastic is the adaptability it obtains from its members; while the greater the tendency towards increasing stability below, the more does it force to the surface the disturbing elements inseparable from so vast a bulk; and thus laughter performs a useful function by emphasising the form of these significant undulations. Such is also the truceless warfare of the waves on the surface of the sea, whilst profound peace reigns in the depths below. The billows clash and collide with each other, as they strive to find their level. A fringe of snow-white foam, feathery and frolicsome, follows their changing outlines. From time to time, the receding wave leaves behind a remnant of foam on the sandy beach. The child, who plays hard by, picks up a handful, and, the next moment, is astonished to find that nothing remains in his grasp but a few drops of water, water that is far more brackish, far more bitter than that of the wave which brought it. Laughter comes into being in the self- same fashion. It indicates a slight revolt on the surface of social life. It instantly adopts the changing forms of the disturbance. It, also, is afroth with a saline base. Like froth, it sparkles. It is gaiety itself. But the philosopher who gathers a handful to taste may find that the substance is scanty, and the after-taste bitter. Society, according to Bergson, depends on adaptability. Any sort of “MECHANICAL INELASTICITY” (emphasis his) in one’s behavior therefore threatens society. The response is derision: “This rigidity is the comic, and laughter is its corrective.” This fairly straightforward hypothesis conceals a tension: one who does not change becomes funny; yet society reacts by trying to shame him, through laughter, into changing. It’s an interesting contention, a bit too bleak and reductive for me to embrace wholeheartedly. But if it’s possible to abstract out from Bergson’s argument without discounting it, to ignore his insistence that laughter “must have a SOCIAL signification,” I’ll endorse a broader version: deviation is funny; or, broader still, variation is funny. If true, there is comedy, at least comedic potential, in Frecon’s work as well as Masullo’s. A deviation, difference, an alternate form— variation, of course, is not itself alone. It is dependent, requiring a backdrop, a standard or norm, against which it may stand out. It almost always implies a preposition: a variation of, a variation from. It has, then, the dyadic structure of most humor: the two-part joke, set-up and punchline; the gap between terms that irony requires. In the works of Andrew Masullo and Suzan Frecon, there are both what I could call “general” variation, which depends on an externality, and “specific” variation, which is internal. An example of the former: in the fourth of his paintings described above, Masullo eschews the basic picture-making convention of creating compositional balance through repetition of hue, refusing to “move a color around.” Or Frecon’s cathedral series, variations on a theme: multiple works that derive from a single drawing. 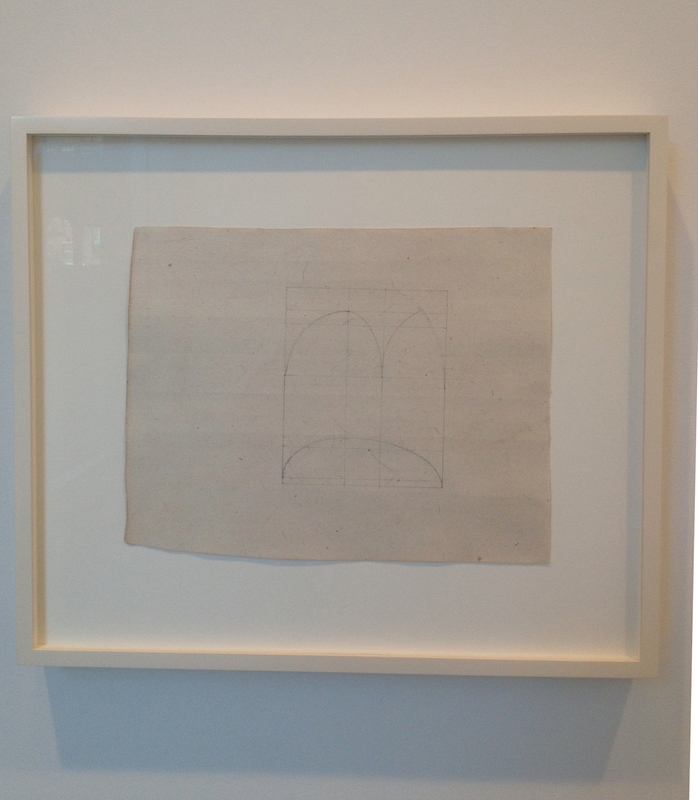 As for “specific” variation— nearly any of the Masullo works described above qualifies in one way or another. And, for both Masullo and Frecon, I’ve cited examples of figure-ground reversal, instances where spatial relationships have flip-flopped within an individual work. I’ll not overstate my case: Frecon seems to methodically work through ideas while Masullo playfully, even willfully challenges them. But I can’t help seeing a sly, droll wit here and there in Frecon’s work. In truth, I’m not so interested in particularizing this discussion. I am intrigued, though, to begin to imagine a comedy that is methodical rather than ludic.